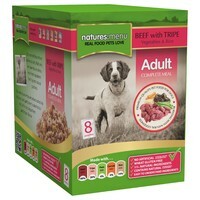 Natures Menu Adult Dog Food Pouches (Beef with Tripe) has been prepared from whole cuts of Beef and nutritious Tripe with fresh vegetables and wholegrain rice in a complete and balanced recipe. Beef is an excellent source of Protein, Iron and B vitamins, and is packed full of the essential nutrients needed to help maintain health and vitality. Tripe contains a diverse profile of nutrients including enzymes, natural probiotics and co-nutrients.